In Colombia, where ripe coffee blooms across green mountain ranges throughout the country, a cup of coffee is never far from your fingertips. In many cities and towns, hawkers pace the sidewalks or set up stalls packed with plastic thermoses steaming with tinto. But the six ounces of coffee—served in plastic cups as thin as the brew—can be so poor that you’ll forget Colombian beans often set the standard for quality coffee throughout the world. Juan Valdez is the newest and by far the biggest name in coffee trying to open Colombians’ minds to the possibility of expecting more from their beans. Last year, the brand christened a new experimental café in Bogotá, called Café Orígenes, designed around the idea of educating guests about the origins and flavor profiles of Colombia’s various regional varieties. Customers also get to try coffees made with alternative brewing techniques such as Chemex or AeroPress. The options overwhelmed me, even though I was used to the sophistication of New York’s third-wave coffee. But as I stood there in the café, asking about the best preparation method for a “smooth, balanced, and clean” selection from Huila, the options overwhelmed me, even though I was used to the sophistication of New York’s third-wave coffee. Would the attention to flavor and origin help pique more interest in coffee among Colombians—who drink less than half as much coffee as Americans and import the large majority of what they consume—or would most feel even further removed from coffee’s trajectory towards gourmet? Juan Valdez’s new offering is not the grand entrance of third-wave coffee to Colombia. One of the first specialty roasters was Café Devotion. Café Devotion has the distinction of selling one of the most expensive coffees in the world—a Gesha that goes for $160 per pound. Apart from the main café, Devotion runs a storefront tucked into the Bogotá Hilton that it calls the Botica de Café, or coffee pharmacy. The Botica draws a mostly suit-and-tie crowd, and the few customers not in business attire were obviously foreigners, some toting rolling luggage. The ambience was warm, like an old-fashioned soda fountain. Behind the long wooden counter, bags of coffee were shelved alongside old glass prescription bottles. But the café still left something to be desired. Their cold brew was served in a wine glass and tasted like a bitter substitute for the mild cold brews prominent in equally sophisticated American cafés. The $5 price tag felt heavy, like being overcharged for wine in France. Perhaps the lackluster coffee could be blamed on Devotion’s lack of talent behind the barista counter. Amor Perfecto, located in a renovated two-story home in a residential neighborhood in the east of Bogotá, is quietly producing some of Colombia’s finest baristas. 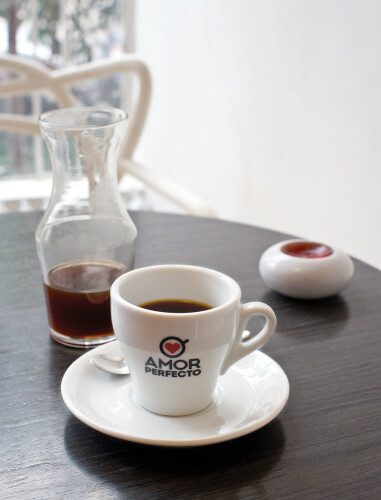 For years it was the home of National Barista Champion Ever Bernal, but after he left to start his own company Amor Perfecto won the 2013 contest through barista Nicolás Rico. The service at Amor Perfecto. Everything about Amor Perfecto was clean and crisp. Natural light spilled over the modern furniture and white walls of the bright downstairs café. The Café Lab, where customers could see how beans go from green coffee to a finished cup, was in tidy order. The cup of Cauca that I enjoyed had high notes of citrus and benefitted from the use of the AeroPress. But the crowd there was mixed—one table spoke Spanish while at a small booth another pair conversed in English. How deeply was the third wave affecting Colombia’s coffee culture? Colombians will talk fondly about coffee. Graciela Jaime, a native Bogotano who with her husband, runs a blog called Michael and Graciela. “We have the best coffee in the world and do not like people to ruin it,” she wrote in an e-mail explaining how highly regarded coffee is among Colombians. “Probably eighty percent of Bogotanos drink tinto,” according to Graciela. Tinto, the Colombian name for black coffee, can vary in quality. Poorer households make it by mixing grounds in a pot with boiling water, but many Colombians have drip or stovetop coffeemakers. “Even at offices the employees demand good, fresh coffee, that is why most places have a maid that makes fresh coffee,” Graciela wrote. Many Colombians drink it, but few drink a lot. The average person consumed 1.8 kilograms of green coffee in 2008, just under four pounds, while people in the US drank 4.2 kilograms, more than nine pounds, according to the World Resources Institute. It’s not simply that Colombia is an exporting country—Brazil, which exports more than double the coffee as Colombia, consumes 5.6 kilograms per person. One factor that seems to correlate with levels of consumption: the size of the middle class. Nine of the eleven countries that consume more than six kilograms of coffee per person rank in the top twenty by median per capita income, based on Gallup surveys from 2013. (Iceland did not produce a large enough sample size for Gallup). The UN has declared that Colombia’s cities are the most unequal in all Latin America—a feat considering its neighbors are Chile and Brazil—leaving few middleclass citizens to buy pour-overs and cold brews. The cruelest part of all is that the coffee most people here enjoy comes not from the world-famous Colombian bean, but inferior substitutes from Ecuador and Peru. According to DANE, the National Administrative Office of Statistics, eighty percent of the coffee consumed in 2012 was imported. Most Colombians who do buy coffee go for cheaper labels like Sello Rojo or Aguila Roja, instead of brands like Juan Valdez. What’s left is that twenty percent. The National Coffee Growers Federation director of communications Luis Fernando Samper explains that they began a strategy focusing on denomination of origin in 2006 as a way to focus on these customers. “We believe the best bet for a coffee grower is that the origin becomes important in the decision making of a given consumer,” he said. The brand already altered Colombia’s coffee scene in 2002, when it opened its first café in Bogotá’s El Dorado airport. Juan Valdez and his mule Conchita were among the first to welcome those flying into Bogotá, thus the brand was more visible to tourists than Bogotanos. After El Dorado, Juan Valdez Cafés opened throughout the city, as well as in Medellín and Cali. By 2004, there were eleven locations in Colombia. In 2013, there were 170, complemented by sixty-eight locations outside the country. The expanded retail offerings didn’t tap into Colombia’s specific coffee growing regions any more than the cafés opened by Dunkin’ Donuts, which expanded into Colombia in 2005. 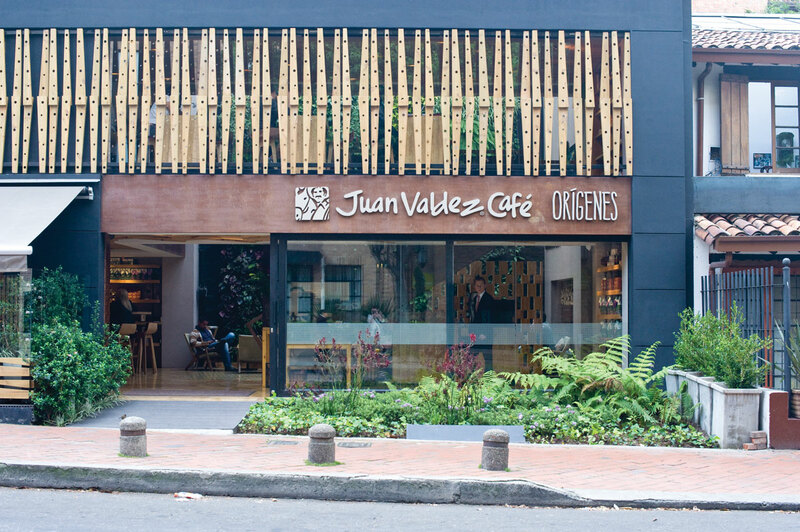 Samper says this approach has left some coffee drinkers wanting more, something Juan Valdez’s focus on coffee origins will serve, beginning with the new café in Bogotá with plans to expand to other locations. “It’s going to be for those coffee consumers that are desperate, if you would, for knowing more about coffee,” he explained. Allowing customers to learn about the regional aspects of quality Colombian coffee “with the authority of someone who really knows the farm and knows where coffee comes from, is something that we believe is going to have a wider appeal as we go along,” he said. The expanded retail offerings didn’t tap into Colombia’s specific coffee growing regions any more than the cafés opened by Dunkin’ Donuts, which expanded into Colombia in 2005. Samper says this approach has left some coffee drinkers wanting more. Oliver Strand, who writes about coffee for the New York Times, remembers that it took half a decade for New York City’s flirtation with third-wave coffee to turn serious. “It all started in December 2001, when Ninth Street Espresso opened on East 9th Street,” he said. “I feel that coffee started to gain traction in 2006, and emerged from the fringes in 2008.” By then, he says, Joe had settled into its West Village location, Stumptown was about to open shop in the Ace Hotel, and Intelligentsia and Counter Culture beans were available throughout the city. All that was, after all, only seven years after the first Starbucks opened in Manhattan in 1994. Perhaps Bogotá’s coffee drinkers are ready for a similar overhaul. Back in Bogotá at Café Orígenes, I had my choice of seating, though one woman was stretched over the length of an entire couch, typing on her MacBook with her shoes off. The shop is not just devoted to education, it’s one of the most relaxing cafés you can visit, with armchairs and couches spread out through two floors and a rooftop deck for warmer days. The cup of Huila—which the barista insisted be made with a V60 or a Chemex—was smooth, with some high notes of fruit but overall a fuller taste than Amor Perfecto’s Cauca. But if Juan Valdez is hoping to educate customers on the differences between Colombia’s regional varieties it will be difficult—tastes between the regions vary only subtly. As a way to advertise the possibilities of Colombian coffee, cafés like Orígenes will find some success, but as a way to ignite a third wave of coffee drinking, Colombia may not be prepared. —Peter D’Amato is a freelance writer based in Brooklyn.